This is a Bible reading plan that is designed to involve children with all aspects of the Easter message. Through this plan, children will become familiar with such events as Palm Sunday, the prayer in the garden, the betrayal, the trial, the death and the Resurrection of Jesus Christ. Application questions, suggested activities & videos are also included in the plan. 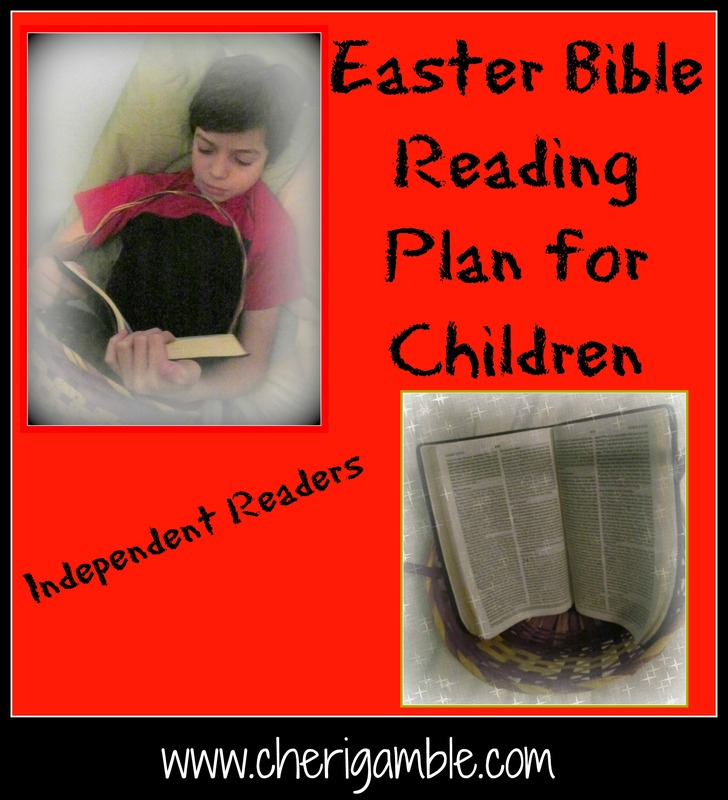 If you have younger children, you can find their Easter Bible Reading Plan here. 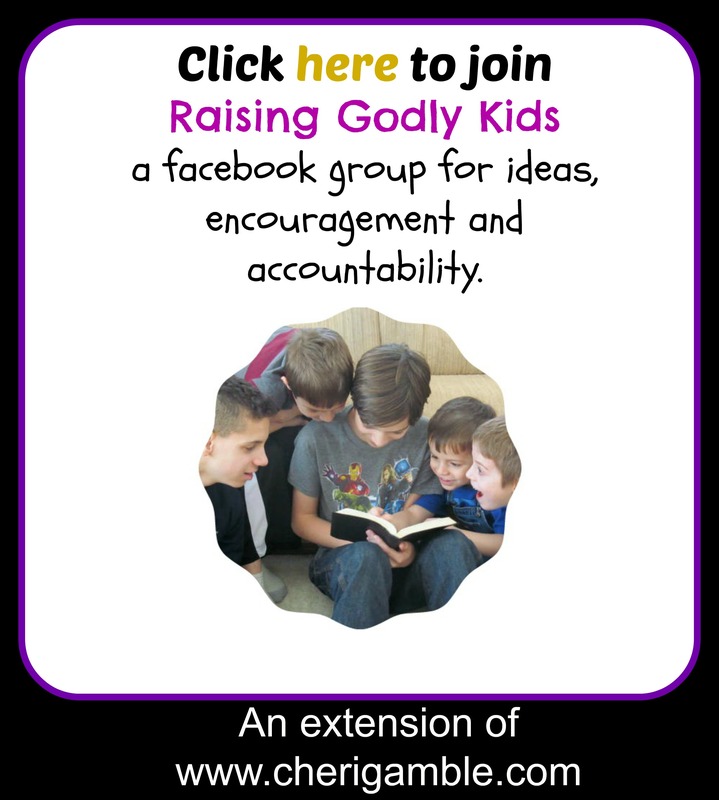 If you decide to participate in this year’s plan, please join our facebook group for encouragement, accountability, and more ideas. What did Jesus do when He got to the temple? Why? Why do you think He was upset about what He saw at the temple? The temple was supposed to be a place where people could worship God, but the people had turned it into a marketplace, making true worship very difficult. Is it ever difficult for YOU to worship Jesus? When? How can you make sure that you are always worshiping the Lord with the right attitude? Spend some time worshiping Jesus today. Additional Activities: Research and prepare a Passover dinner for your family, Decorate a “palm branch” with things you praise Jesus for or make a palm tree with your family and have each family member put a branch on it full of praises, Give a special offering to Jesus. Here’s one from Bee-inspired that uses old cereal boxes! And an idea from Creative Endings that works well for those of you who are really artistic! awhile, Have “Secret Servants” with your family – each one of you draw another person’s name and you have to secretly serve that person this week, Take communion to someone who cannot leave their house (or nursing home) this week. Who approached Jesus in the garden? Why were they coming? What was significant about Jesus’s response in verse 5? In verse 5, Jesus uses the Name for God (“I AM”) in referring to Himself. That Name had so much power that the soldiers fell to the ground! That is power! Jesus also showed His power one other way in these verses. How? Even though the soldiers were coming to arrest Him, Jesus showed His great compassion and power by providing healing when it was needed. Watch this video about The Great I AM. This is another Psalm of David that also contained prophecies referring to Jesus. Can you find the prophecy in these verses? It can hurt to be betrayed by a friend. Have you ever had a friend hurt you? Have you ever hurt a friend? Spend time today praying about how you can be a better friend. What happened to Jesus in these verses? What did the people say about Jesus? Some people stood up and lied about Jesus. What were the lies they were saying? God wants us to ALWAYS tell the truth. When is it hard for you to tell the truth? When is it easy? What can you do to make sure you always tell the truth? Make a poster or bookmark to remind you to always tell the truth. Additional Activities: Invite some of your friends to church with you, Take a stand for Jesus by telling someone about Him, Write your own Psalm, Make your own music video to go along with a song about standing up for Jesus. Who did Jesus appear before in these verses? Where did Jesus say His kingdom was from? Jesus told Pilate that He came to testify to the truth. How does Pilate respond to that? Pilate says, “What is truth?” Today, many people say the same thing. Many people think that they can decide for themselves what is true and what is not. However, the Bible gives us truth and the Bible never changes. What are some of the truths of Scripture that are under attack today? How can you be sure that you are following the Truth? Here is an excellent article from Focus on the Family that you might want to read about this very topic (it is best for older children/teens). What was the tradition of the people during the feast of the Passover? Who did the people ask Pilate to release to them? Why? The people demanded that Jesus be crucified – which is what had to happen. In the middle of this, however, one person was given a second chance at life. In all likelihood, had it not been for Jesus, Barabbas would have been crucified instead. If you were Barabbas, how would you have felt at this time? Our God is a God of second chances, isn’t He? Spend time today thanking God for always giving YOU a second chance. remind you of the crown of thorns that Jesus wore. What did the soldiers do to Jesus? When they took him out to be crucified, they needed to find someone to carry the cross for Jesus. Who did they find? How do you think you would have felt if you had been forced to carry Jesus’s cross? Write a journal entry from the perspective of Simon of Cyrene and share it with your family. Additional Activities: Do an indepth study on absolute truth, Act out a court trial, Write a play about the events you read this week, Draw pictures to represent the events you read about this week. Who did Jesus see when He looked down from the cross? What did He say about His mom? Jesus wanted to make sure that someone took care of His mom, and so He gave that responsibility to John. Even at the very end, Jesus was obeying the command to “honor your parents”. He was honoring His mom! How do you honor your parents? Look for ways to show them love today! Make a card for your mom and dad expressing your love for them. And how about a snack for today? Make a “temple veil” out of fruit roll ups! Tear it in two as a reminder that the veil was torn in two and we can now have a personal relationship with God! Additional Activities: Make a cross necklace. Make two and give one away! Do something special (in secret) for your mom and dad, write a newspaper article from the point of view of the Jews about the temple veil being torn in two. Why did they make the grave secure? What were they afraid would happen? So now Jesus is in a tomb, the tomb is sealed, and the tomb is heavily guarded! Things seem impossible, don’t they? But remember, NOTHING is impossible with God! Is there anything that you feel is impossible in your life today? Spend time praying about it! Then find a rock and decorate it as a reminder that nothing is impossible with God. There were many, many prophecies in this passage that we have seen fulfilled in this week’s readings. Can you find them all? Make a list of all the fulfilled prophecies that you can find. This passage talks about sheep a lot – we are compared to sheep in that we have lost our way and need Jesus to bring us back. Make some sheep snacks to go along with this passage. dead! Unfortunately, there are many people who don’t believe. Spend time today praying for those people who refuse to believe that Jesus rose from the dead. Additional Activities: Color Easter eggs as a reminder of the empty tomb and the new life in Jesus, Make Easter cookies for a neighbor, invite a neighbor or friend to church, share your faith with someone! What happened to the disciples who were walking on the road to Emmaus? What did they do as soon as they realized that they had been talking to Jesus? I love this story – the two men had already walked seven miles. Then, they discover it was Jesus, and they turn around and walk back seven miles again to let the others know! They were that excited to share Jesus with others! How excited are YOU to share Jesus with others? Would you be willing to go out of your way to share the Good News with your friends? Ask God to give you that kind of excitement today! Additional Activities: Attend a Good Friday, Sonrise Service and Easter Service this week to celebrate the resurrection of Jesus Christ!